Former Rotherham United defender Shaun Cummings featured for Doncaster Rovers in their U23 Premier League Cup defeat to Sheffield United. 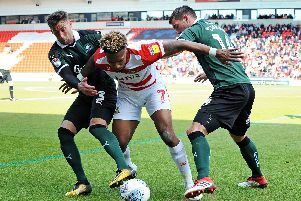 The 29-year-old Jamaica international – who was released by the Millers in the summer – played 62 minutes at right back at the Keepmoat , while another unnamed trialist was used for the entire game at centre half as Rovers suffered a 3-1 defeat. “Shaun Cummings is someone that’s got good experience and had a couple of promotions,” Rovers boss Grant McCann said. Rovers’ U23s were unfortunate to not take something from a competitive group stage game with the Blades. John Schofield fielded a mixture of youth and experience with Ali Crawford, Jermaine Anderson, Alfie May and Alfie Beestin all featuring. Jordan Hallam grabbed the first of his hat trick on 25 minutes to put the Blades ahead, slotting past Louis Jones after being played through by Simeon Oure. But Rovers were level on 38 minutes when Crawford curled a superb low free kick into the bottom corner from 20 yards. Both sides had chances in the early stages of the second half with United keeper touching over Anderson’s powerful drive while Jones saved from Oure. Hallam smashed a shot off the post before slotting in from close range two minutes later to put United back in front. Will Longbottom crashed a superb effort off the crossbar while Beestin and May both went close as Rovers pushed for the equaliser. But the Blades sealed the win five minutes from time with a penalty when Cody Prior brought down Oure and Hallam drilled in from the spot. Rovers are currently without any points in their group, having lost their opening game against Everton.